Why Are So Many Black Men in Prison? 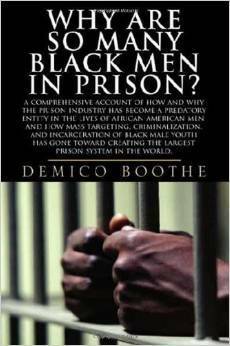 African-American males are being imprisoned at an alarming and unprecedented rate. Out of the more than 11 million black adult males in the U.S. population, nearly 1.5 million are in prisons and jails with another 3.5 million more on probation or parole or who have previously been on probation or parole. Black males make up the majority of the total prison population, and due to either present or past incarceration is the most socially disenfranchised group of American citizens in the country today. This book, which was penned by Boothe while he was still incarcerated, details the author's personal story of a negligent upbringing in an impoverished community, his subsequent engagement in criminal activity (drug dealing), his incarceration, and his release from prison and experiencing of the crippling social disenfranchisement that comes with being an ex-felon. The author then relates his personal experiences and realizations to the seminal problems within the African-American community, federal government, and criminal justice system that cause his own experiences to be the same experiences of millions of other young black men. This book focuses on the totality of how and why the U.S. prison system became the largest prison system in the world, and is filled with relevant statistical and historical references and controversial facts and quotes from notable persons and sources.